Now my free hand here isn't great but I think they're pretty cute, lol. So the little Ginger dude is Toulouse. The white princess is Marie. And the little black/grey guy is Berlioz. For Toulouse I used a base of OPI - Rising Star. For Marie I used a base of NYC - Pinstripe White. For Berlioz I used a base of Orly - Faint of Heart. 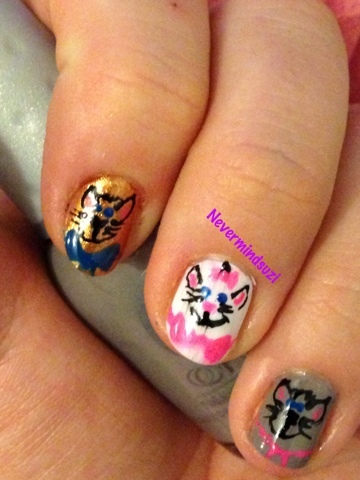 The details of all 3 were done using the Models Own Nail Art Pens. Which Disney movies have you overlooked? So so so cute this is one of my all time favourite movies! yay! 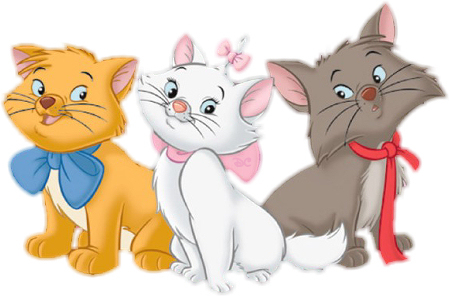 I LOVE THE ARISTOCATS!!! 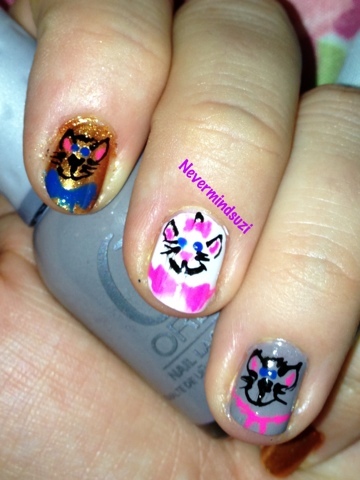 Ahem...sorry...very cute nails!